Hello you lovely lot! I hope you've all had good weekends? I received a rather surprising and delightful email a couple of days ago, telling me I'd been shortlisted for the Amara Interior Blog Awards! Well blow me down, I am completely and genuinely flabbergasted. And I have you to thank, for voting for me. Thank you. Thank you very much. Right then, on with the normal order of things. We are making plans to decorate the hall, stairs and landing this autumn and will wallpaper one small wall at the end of the hallway, so it's the first thing you see when you open the front door. It's a small, gloomy corner which only gets light from other open doors, so it needs to be fairly colourful and cheery, with a nod to retro pattern in keeping with the style of the house and era in which it was built. Top row: Orla Kiely, middle row: Marimekko, bottom row: Mini Moderns, all samples ordered from John Lewis. I usually love that John is so interested in interior design and that all our decisions are mutual, but sometimes I just really wish he'd let me have my own way. We can't agree. More samples will be ordered. We've been making improvements to the house, just small ones but exciting none the less. Our 4 metre wide living room window had a kind of UPVc bottom half which we never liked as it looks so white and plasticky. This is the best photo I could find, annoyingly, taken just after we'd decorated. We had it boxed in with plasterboard and it looks a million times better already, more like the rest of the room, more substantial and more like a proper wall not a sheet of plastic. Most excitingly, it gives me a long, long windowsill! I never thought this would matter so much, but hurrah, a big surface to display stuff on. It doesn't make for very exciting photos, though, does it. Sorry. My shopping lists lately have included a lot of dried fruit and spice. Cranberries, dates, and sultanas, ground ginger, cinnamon and cloves - the flavours and smells of autumn cooking. I made tea loaf, an old favourite and one which I turn to when busy as it's so easy, and like to eat so heavily buttered that you can see teeth marks. I also made a batch of cranberry chutney yesterday. It made the house absolutely stink of vinegar though - and I'm glad the weather was good today because I had the doors and windows opened wide - but it's worth it because it is so delicious, and almost more fun to make than jam. You don't have to watch it and fret about it setting, you just stir it all together and leave it to simmer for an hour then go off and do something else. Like open the windows. I appear to have downloaded a pattern for a poncho, bought the yarn, and am in the process of teaching myself how to do front and back post trebles to make the rib stitch. I did not see this one coming at all! But I'm just desperate to make this right now so that I can wear it while it's still autumnal and not freezing cold. Wow, it's all go in the garden! I've bought bulbs. I've planted wallflowers all over the border in the back garden. These scrappy little things will apparently bring colour to my border throughout the spring. Hard to believe, I know. This hydrangea was a gift from my mum. My parents have a huge one in their front garden and every year the blooms are magnificent. I've planted this in a sunny, roomy spot and I have high hopes. I also deliberately planted it right by the front door so it greets me every time I enter the house. Also, this is the kind of area where front gardens are immaculate and I feel the pressure, frankly. The sedum is flowering. I don't really know a lot about sedum (or any plant, let's be honest) but I really like it. It's shape and slightly faded pinks and greens remind me of the kinds of plants that grow wild by the beach, like sea cabbage. I have no idea why. This one was from my sister's garden and it's growing well in it's new home. So another weekend of pottering draws to a close. I wish weekends were longer. My hours at work have increased to the point where I am almost working full time and I'm feeling the difference. Everything it rushed and time snatched in an hour here, half an hour there. I will be glad when things eventually settle back down to how they were before. You're getting an amazing amount done, even if you are pressed for time. My sedum just started blooming in the past few days too. I hope your work calms down soon, it sounds a bit stressful. I'm sure you're doing a great job with it all. Hope you have a great week. A blog decorating award! How lovely for you, as the house is coming along so nicely. The cake looks delicious and I can't believe the beautiful wools you can get over there. Unless we pay an arm and a leg for ours, the less expensive ones aren't as nice, but I'm on a budget these days, so have to take what comes. (I'm taking part in Jo's crochetalong over at Through the Keyhole). Your garden is starting to take shape and I must get another Sedum after seeing yours, oh and some hydrangeas. Take care. Oh well done on the shortlisting, that is good news. I wonder what colour your wallflowers will be? I've just moved some blood red wallflowers into their flowering position at the allotment (they are very easy from seed) and I'm going to plant some deep red tulips among them to bulk up the display and give me some cutting material too. Love seeing all your ideas, everyone a winner to my eye. Huge congrats to you and well deserved i do hope you go on to win!! I have made that poncho and have been wearing it recently, its great fun to make and i am sure you will enjoy hooking it up? 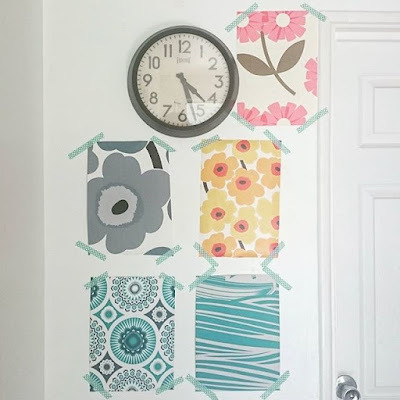 Another coincidence in this post I have that mini moderns darjeeling wallpaper in the same colour in our kitchen..we love it, difficult to choose from samples...lots of luck ! Lots to keep you busy with yarn over the next couple of months there then. What a good idea to have the plastic white boxed in and a real bonus getting the new log shelf. Out of all the papers I love the one which looks like daffodils, good luck with the selection process. The wallpaper samples are a great idea - my personal favourite would be the one on the left in the bottom row. Flower patterns are great, too, but somehow I always think they will look "out of season" in winter. It was a very good idea to have the plastic part covered. Will you still be able to open the windows easily when there are things on the sill? All my windows open to the inside, so the only window sill I ever put anything on is one of my two kitchen windows which I very rarely need to open. what a lovely post x the window transformation is amazing, love how it looks part of the house now, and that window sill, oh yes! Wowee! Many congratulations on being shortlisted for the interior awards. I shall keep everything tightly crossed for you my clever stylish friend. Re the wallpaper, I'm sure it will come as no surprise that it's a no brainer for me - Orla's pink flowers, every time. It's just perfect and there's lots of white in the print which will help make your hall lighter. Am I helping?! Keep an eye out for my Yarndale blog post; I got to meet (and take a few photos of) a lot of Edward's Menagerie in the flesh and they are just adorable. The rabbit and the sheep were my favourites. Love how crochet projects just happen to happen, eh? Funny thing that is! It will look gorgeous! Enjoy the making! And congrats on the award shortlist! Well deserved!! Front and back post stitches are just changing where to put the hook, easy peasy. Nothing different to the stitches themselves.Two minutes and the idea should be in your head. There is very little in the crochet that is not basic crochet. It's not really much of a learning curve. Anyone who can crochet can do these stitches too. Just read where to put your hook and look at some pictures or watch on youtube - In through the front of the post of the stitch below and around it (instead of the loops at the top of it), or in round the back and through to the front. That is the only difference. No more scary than the original learning of crochet stitches, easier in fact as they are already known. This information is easily found in crochet books, on line and often on the pattern. Congratulations on being shortlisted for the blog award. It'll be hard to decide on a paper to use and even harder to get agreement! The poncho looks lovely. I'm hoping to rip out my disastrous Aran coat and make a poncho instead. Thanks for the idea by the way. I'll have a look at John Lewis as I'm thinking wallpaper for the new place, just on the odd wall. That tea bread looks delicious and yes, thickly buttered is most definitely the way to go. 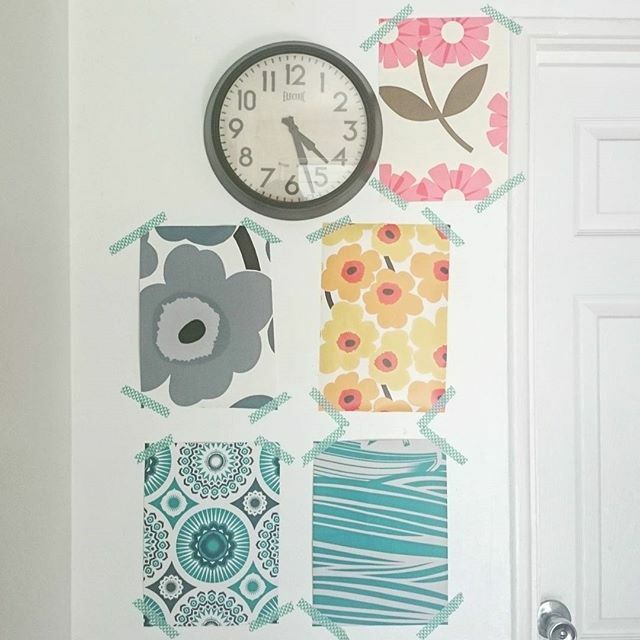 I love the idea of wallpapering just one wall... I can't wait to see which paper you choose! Your new home is so lovely, and I now you are enjoying decorating it. I just love the smells of fall baking/cooking... they are the best! Yes many congratulations to you on being shortlisted, fingers crossed! Have you seen Orla Kiely's Acorn Spot wallpaper in Sea Blue/Poppy? I think it would be lovely in your space. Excellent news on all fronts. Congrats on making the short list and with all your wonderful yummy things to eat and crochet. Oh I do enjoy these posts of yours. Many congratulations on making the shortlist. What happens to the winners? I'm thinking that your chutney is something I'm going to make soon. I don't have Nigella's Christmas recipe book, so must get hold of it. We are in the throws of decorating and de cluttering here. It's all a pain in the arse to be honest. So much to be done. I'll be very interested to see the final wallpaper choice; I'm sure it will be perfect. You have such a good eye. I like the yellow floral wallpaper.. the perfect pop of color and so very retro..
well done on the blog shortlisting. I love the look of that poncho. As for the wallpaper, I can't decide between the pink flowery one or the blue circles! If all else fails, put up some pictures or even frame your favourite wallpaper samples! Loved your kitchen photo! I don't know why but I love seeing what other's have in there! great news on the blog shortlisting....a fantastic achievement. I love these type of posts as it makes me realise I'm doing similar things, and it's great to be part of a creative community! Congratulations for being shortlisted! Brilliant news! What an improvement to that window! Well done you, on thinking about using plaster board to fill it in and make it look like a 'real' wall! Mot sure about the papers on the wall, but of all of them I like bottom right, those turquoise blues in stripes. But they're not me, I'd not be able to live with them - they are a 21st cent interpretation of 1950s décor and they just miss (well, by a mile, really.) But they are colourful, I'll give you that!